Ofcom today reveals which broadband and phone companies are falling far short in serving their customers, and those who are setting a strong standard for satisfaction. 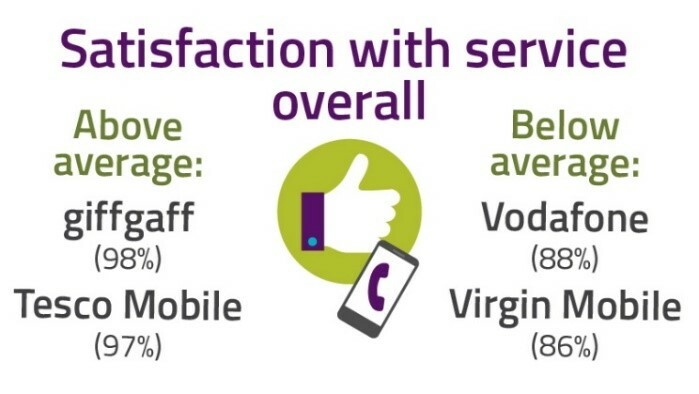 In our most comprehensive survey of telecoms customer service, published today, Ofcom shows how each major provider performs on measures including customer satisfaction, complaints and call waiting times. The report provides vital insights into what level of service phone and broadband users can expect, helping them shop around for a provider that meets their needs. Who's best for broadband service? Overall, eight in ten broadband customers (80%) say they are satisfied with their service, while 15% have a reason to complain. 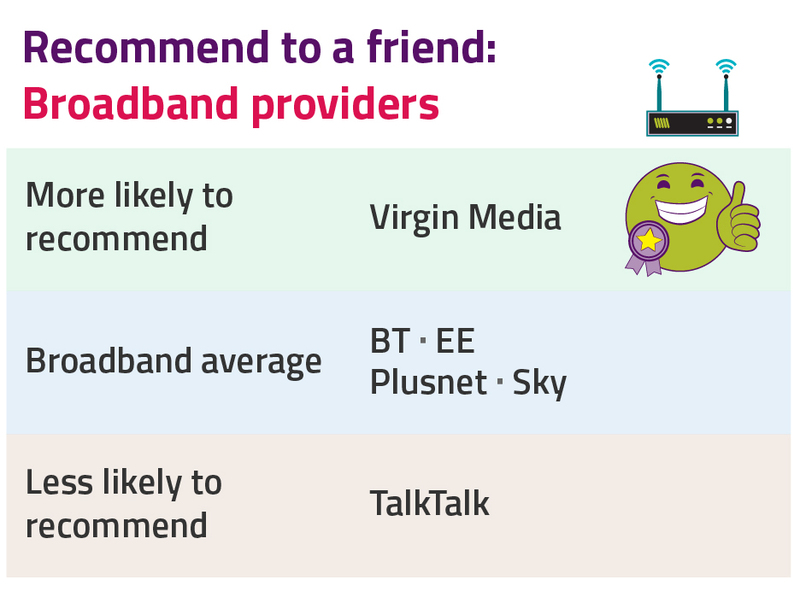 Virgin Media broadband customers are more likely than average to recommend their provider to a friend; and Virgin Media is the only provider with above-average customer satisfaction for broadband speeds. TalkTalk customers are less likely to recommend their provider to a friend , and its overall satisfaction is below average. TalkTalk scores poorly on most customer service measures. Its customers are less satisfied with reliability, more likely to have a reason to complain, and less satisfied with how their complaints are handled. Across the industry, satisfaction with complaints handling could be improved. Sky and EE perform above average for how they handle complaints with around six in ten customers satisfied. The amount of time people are kept waiting on the phone to customer service lines varies widely. Plusnet customers have to wait the longest – nearly eight minutes on average. EE customers wait the shortest amount of time to get through – only 48 seconds. In mobile, satisfaction is generally high. Overall, nine in ten customers (91%) say they are satisfied with their mobile phone service, with just 4% having a reason to complain. 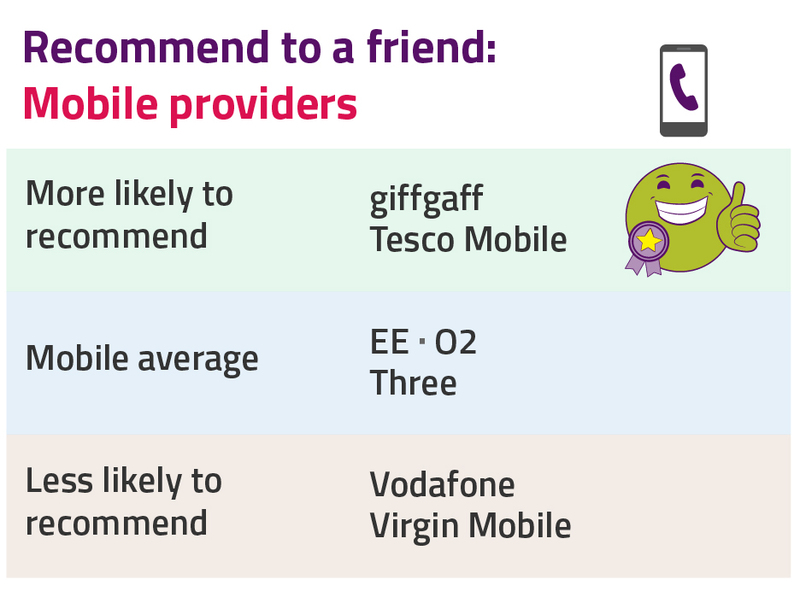 Among mobile companies, Tesco Mobile and giffgaff customers are more likely to recommend their provider to a friend. Vodafone and Virgin Mobile are less likely to be recommended . These two companies also score below average in a number of satisfaction rankings, particularly when it comes to handling complaints. Tesco Mobile , giffgaff and EE generally score highly compared to the sector average across several measures of service quality. Lindsey Fussell, Ofcom’s Consumer Group Director, said: “People often focus on price when they’re choosing a phone or broadband provider. But there are big differences in the customer service offered by providers. Arming consumers with information is one of several Ofcom initiatives designed to improve service quality. We recently gave an update on our work to make it easier for people to shop around, including work to alert customers when their contract expireds. We are also ensuring that people receive automatic compensation when things go wrong; get better information on broadband speeds before entering a contract; and benefit from tough targets on Openreach for repairs and installations. People can find simple, handy tips on improving their broadband or mobile service at Ofcom’s website. TalkTalk has a negative ‘recommend to a friend’ score; whereas Vodafone and Virgin Mobile both have positive scores, despite the fact their customers were less likely than average to recommend their provider to a friend. Overviews of key data for each market are below. Red or green shading and * indicates significantly lower/higher than the sector average.